Why Are Now Some Trainers Condemn The Swiss Ball? Swiss balls have been available within rehab for a long time as well as in physical therapy. When they entered into the fitness world, they were probably over-praised. It’s not necessarily that they didn’t deserve this honor as well as interest, it's that many fitness “experts” put the Swiss ball up as a miracle product to use to get ABS of steel , instead of explaining that the Swiss ball is merely a tool - just like hand weights, barbells, balance boards or any other training equipment. Consequently, complete exercise plans were developed around the Swiss ball (whilst ignoring other forms of training), and people misused as well as over-used the ball. Several coaches used the ball for “exercises” that were actually more acrobat acts than core exercises. They have been used for everything from standing on top of the ball and squatting to bench pressing on the ball with 400 pounds (each one most likely as unsafe as the other). Probably because of all this obvious Swiss ball misuse, a number of coaches recently spoke up and openly dismissed the ball as a fab. This has triggered customers as well as fitness enthusiasts being more baffled than ever: Coach A states, “The ball is the best idea ever since electricity and coach B claims “the ball is definitely and always was a gizmo.” The fact remains somewhere in between lies the truth. Swiss balls are usually highly effective, easily transportable, affordable as well as a functional training tool.. The usefulness of the Swiss ball is simply unrivaled because by the fact that you can use a Swiss ball for a 60 year old inactive woman that suffers from muscle weakness or use the exact same ball to help a professional fighter develop strength and add power to his blows. You can also use the Swiss ball to develop a six pack abs as well as to workout basically each muscle in your entire body. To provide you with a research-proven illustration of just how efficient a Swiss ball might be, let’s concentrate on probably the most basic and well-known exercise associated with abdominal training: The Crunch. As most folks recognize, the crunch is really a altered (incomplete) sit up that requires elevating the head, neck and shoulder blades upwards off the floor. Numerous coaches believe that the crunch is highly overrated as well as over-used. We won’t argue, as we acknowledge there’s a lot of fact to that. Nevertheless, the crunch can be significantly enhanced with one simple alter: Perform the AB crunches on a Swiss ball. from Francisco J Vera-Garcia, Sylvain G Grenier and Stuart M McGill have demonstrated that the Swiss ball crunch (unstable surface) effectively recruits more muscle fibers than the floor crunch (stable surface). This leads to greater strength, stability and muscle development in your core region. 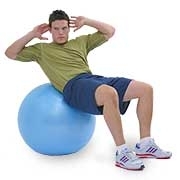 The body placement on the Swiss ball could reduce or even increase the amount of muscle activation. It had been proven that when placing the ball at the lower lumbar region, there was clearly a 66%, 93% and 104% improvement in upper abdominal muscle, lower abdominal muscle as well as external oblique activity, correspondingly. The new research is actually evidence. Additionally, it shows how the ball is a functional device regarding workout development: The high on back placement is easier, while the ball lower on the back is more challenging, helpful for different strength and fitness levels. Additional development can be included by using resistance (dumbbell or resistance bands). Use the ball as part of a balanced exercise plan, that includes other equipment such as weights, resistance tubes and your own body weight. Forget the potentially dangerous ”circus act. Use the Swiss ball in a clear place, utilize great workout form, clean them frequently, examine them for leaks and we guarantee, you will have a wonderful functional training tool that will last you for years and never go out of style. Fitness fads will always come and go, but the Swiss ball is still a champion.